One of the first things I work on with a new horse is stopping. No matter what a horse does, it is comforting for a rider to know that he can stop the horse. Many riders depend on pulling back the reins to stop their horses. They sometimes stick their feet forward in the stirrups with stiff legs and lean backwards so they can applied more pressure. They sometimes depend on curb bits with long shanks thinking this is necessary to control their "active" or "spirited" horses. None of these things should be necessary. If a rider is sitting balanced, relaxed, and moving with his horse, the horse should become accustomed to the two bodies moving together. Then, if the rider simply stops moving, the horse should also stop moving whether it has been walking, trotting, cantering, or even galloping. If reins are necessary, they should be used in a resisting fashion rather than with a pulling action. These two may look similar to someone watching just the horse and rider and not the surrounding environment. However, when the rider uses the reins to resist, it is the horse that is putting the pressure on the reins rather than the rider. This may be thought of as the rider stopping his hands in relationship to the ground or a fence post along the side of the arena. The rider's hands stop, but his body continues forward towards his hands until the horse stops. Stopping in this way should keep the rider from pulling too hard on the reins. This method may feel similar to the rider, but the horse feels the difference and soon realizes that it is he who is putting pressure on the reins and soon learns to stop. The rider, then, releases any tension before the horse steps backwards to release the tension himself. Of course, there is a little more to it if you want the horse to bring his rear underneath him. You might add a little leg pressure to encourage the horse to step under itself as the reins tell the front end to stay put. 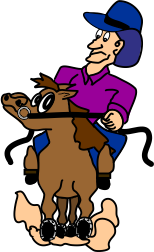 The rider should be careful not to push downward with his seat bones but allow the horse to round his back and lift the rider's seat. Any rein pressure should not be released until the horse is fully stopped or the horse may begin moving again. But the pressure should be release as soon as the horse stops to let the horse know that he did what he was supposed to do. If the rein pressure is not released, the horse may either try to release it himself by backing or by throwing his head. Alternately, he may just start moving again. A rider sitting on a horse's back cannot actually keep the horse from moving if it wants to do so. Think of the horse that runs away despite the rider pulling desperately on the reins. When releasing the rein pressure, the rider should be careful not to let the reins get too slack. If the horse were to start moving again on its own for any reason, the rider with slack reins might likely jerk on the reins to stop the horse. A relaxed and balanced rider with hands and reins at the ready would feel the horse shift his weight forward before beginning to walk. This rider could simply squeeze his hands and remind his horse to stay still. Correctly timed, the rider should feel the horse settle its weight backward again without taking that first step. The rider would, then, reward the horse once more by releasing any rein tension without throwing the reins away. Stopping in this way should keep both horse and rider tension free. Horses don't often back up on their own. If possible, they prefer to turn around. Still, riders should learn how to get their horses to back up before a situation arises when this becomes necessary. Most riders seem to think they must pull their horses backwards. You often see them leaning back, sticking their feet in front of them with stiff legs, and tugging on the reins. I have even seen riders who take pride in showing how they can back their horse with slack reins teaching their horse to do so using this same method, sometimes adding vigorous spurring. 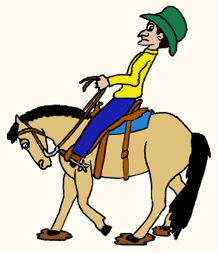 Soon the horse responds to the "warning sign" of the rider leaning backwards before the rider "increases the pressure". Other riders realize that there is seldom a reason to pull on the reins. They simply take the slack out of the reins to set up a barrier. They, then, apply their legs in a driving gesture. When the horse tries to step forward, he runs into the barrier. He then steps backward and is rewarded. Interestingly, most of these riders also lean backwards, though I have never been told why. I employ a different method for getting a horse to back up. I generally set up a barrier with the reins, just in case the horse misunderstands my cues and tries to move forward. Then, I allow my balanced body to "grow tall" by releasing any tension in the muscles of my torso. I then lean forward about one or two degrees, apply a little pressure with my legs, and sometimes give a verbal cue. I have seldom had a horse not respond by backing up. This includes may horses accustomed to being pulled backwards. I lean forward slightly in order to lighten my seat and make it easier for the horse to move the area needed for backing. I feel that leaning backwards makes it more difficult for the horse to move. By their reaction, the horses seem to agree. It is important to realize, however, that if the rider leans too far forward, the horse will be thrown off balance and will try to move forward. On the rare occasion the horse does not readily respond, I might encourage movement with a little more leg action — possibly a rubbing or a tapping. I have also found that some horse's respond better to pressure with one leg only. It is interesting, however, that some of these horses respond better to pressure with the leg on the side of the horse's rear leg stepping back while others respond better to the opposite leg. As with many aspects of riding, it helps to experiment to find the best way to do something. But it is always best to look for the gentlest and most natural way.